Do you have a cupboard that’s bursting at the seams with plastic containers and bowls? I know I once did. I stored everything from nuts, to work lunches to dinner leftovers in plastic containers, and I owned a set of well-worn plastic mixing bowls. 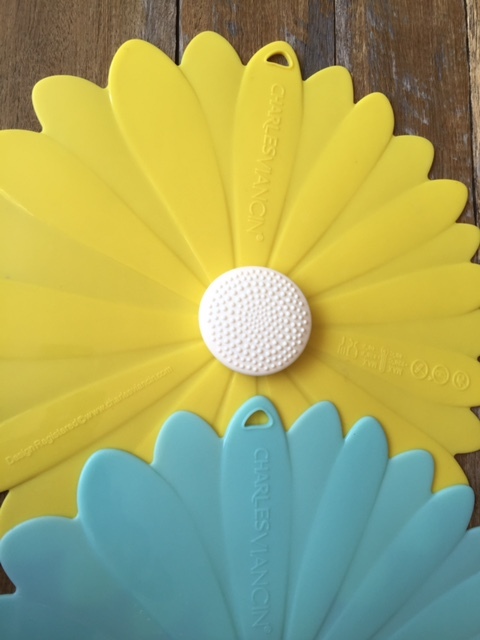 These plastic items were not treasured like many of my hand-picked kitchen accessories – and unsightly discolouration and scratch marks usually brought their useful lifespan often to an end much sooner than I anticipated. But plastic is now a thing of the past in my kitchen and I wanted to share why here. If it prompts just one reader to reconsider their attachment to plastic then I’ll be happy. Last year I watched documentary that exposed the potential dangers of the chemicals lurking in plastic. Although many plastic storage products are sold as ‘BPA free’ there’s a whole raft of other potential toxins in plastic – the risks of which are not yet fully understood. This documentary alone prompted me into action. The following day my plastic containers and bowls headed straight for the bin. At the same time I jumped online and ordered a range of glass products – most of them from Pyrex. I’m now a glass convert and wanted to share here some of the benefits of glass over plastic. Safety – glass doesn’t transmit harmful chemicals into food (this can happen when hot food is added to plastic or when food is microwave heated in plastic). Lifespan – glass containers and bowls will last for years (provided you don’t chip or crack them). Heating – glass is oven proof to high temperatures, so you can, for example, re-heat leftovers easily. Washing – glass is always safe to wash in the dishwater, and will come out sparkling clean every time. Cleanliness – glass isn’t porous and so, unlike plastic, glass containers and bowls won’t stain or absorb food particles and germs. Recycle- ability – glass lasts longer and as much of 80% is recyclable, so it’s better for the environment. Versatility – glass can go from fridge, to the oven or microwave and then straight to your table for serving. Odourless – glass doesn’t absorb the scent of food, a common problem with plastic, so it stays smell free. Savings – glass containers and bowls are more cost effective, because if you replace plastic fairly often then glass works out cheaper in the long run. Attractiveness – many glass storage options have a visually appealing design which makes them much nicer to look at compared to plastic. Perhaps the only problem with glass products is that they don’t always come with a snug fitting lid – this usually sees me resorting to overusing cling wrap to cover my glass bowls. 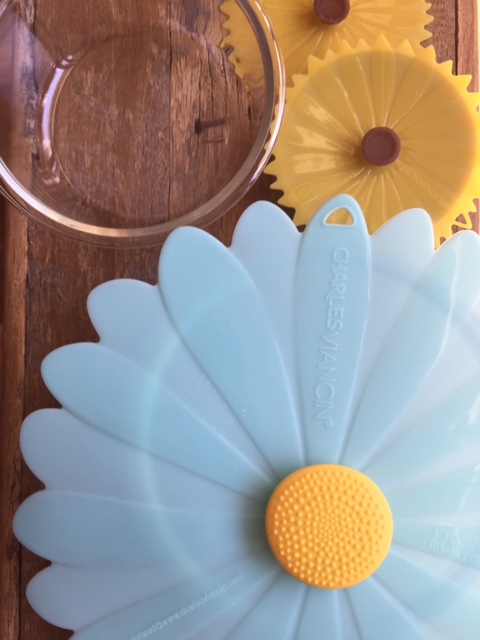 I was prompted to write this post after being sent some complimentary flower inspired lids from Charles Viancin. 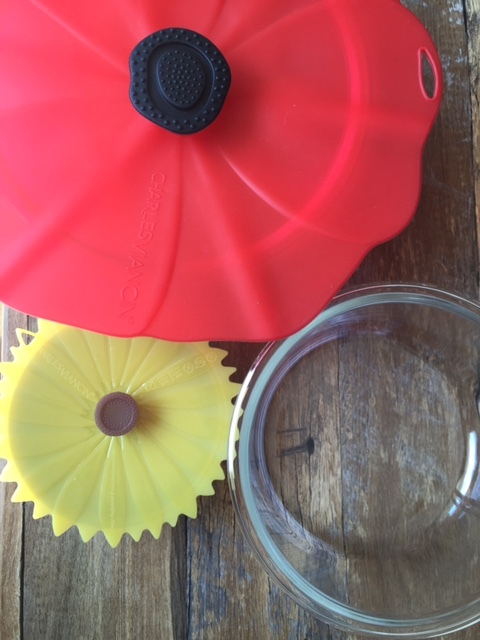 When I saw how well these lovely airtight lids seal any smooth rimmed surface I was very happy to share them here. Charles Viancin is a French brand that offers a range of attractive silicone kitchen accessories. This range includes the lids you see here. They come in a range of sizes and designs. They work just as well on glass, steel, wood and other materials and they’re also heat proof to 220C. Right now every shelf in my fridge hold one of my glass bowls, filled with something yummy, and covered with one of these bright floral lids. If you’re already a glass fan, or if this post has convinced you to reconsider your use of plastic, then great news. Spread the word and get others to switch to glass. Tags: benefits, glass, plastic, storage. Bookmark the permalink. I am a glass convert too! So happy to read this post! That’s good to hear Sandhya – and I’m sure like me you’d never go back to plastic! We switched to glass years ago and it’s the best! I might have to find some of those cute flower lids, how adorable. Lunch containers are mostly stainless steel, fear the boys breaking glass as school. Don’t get me started on my canning jars, they get used for everything! I never really thought of this before but the points you mentioned make so much sense! Definitely worthwhile spending a little bit more and buying glass. And it does look so much better than plastic! Thanks and yes once you really think about the downfalls of plastic then it becomes an obvious choice to switch to glass – I hope you make the move! Food for thought. I agree with you but I must say, I use a combo of both. I love my Pyrex glass with plastic lids but for kids to take their bits and pieces to school in, it is plastic all the way. I hate to think that a shattered glass container at school could hurt someone. Good point Hungry Mum and I also do find glass heavy when using it for my work lunch – but at least you’re using glass at home!